This is the original and flagship product from the Melinda's brand, which manufactures over a dozen hot sauces and other condiment goodness. Made in Costa Rica, I originally became intrigued with this sauce because it's main ingredient was carrots. I've since found the carrot's don't really add a "carroty" flavor so much as a natural, light sweet base, that allows the flavor from the peppers and lime to really shine, with out over powering your meal. CONSISTENCY - Thick, almost gel-like (believe that's a result of the pureed carrot base), which makes deployment from the "shake top" slow. That said, well worth the extra couple shakes. APPEARANCE - Translucent burnt orange color w/ visible specs of red habaneros. SMELL - Fresh, spiced but not spicy, with a hint of acidity from the lime juice. INGREDIENTS - Fresh carrots, choice red habanero peppers, onions, lime juice, vinegar, garlic and salt. This was a pleasant surprise. While it won't take over as my daily Mexican style go-to hot sauce (think Cholula, Tapitio, Valentina, etc. ), it has its moments. I would highly recommend this for consumption with lighter seafood's given its fresh, lime flavor. 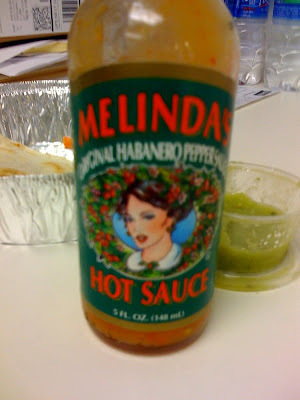 On a side note, Melinda's claims credit for "making the Habenero a household name."